Nissan Motors Co., Ltd., has announced it would begin testing a newly developed intelligent transportation system which allows vehicle-to-infrastructure communication to help reduce traffic accidents and ease congestion. The test, which is being conducted to evaluate the receptivity of drivers to such a system, will run from 1st October, 2006 until the end of March 2009 in Kanagawa Prefecture, about 25 kilometres southwest of Tokyo. About 10,000 drivers, who must be subscribers to Nissan’s CARWINGS navigation service, are expected to participate in the test. Applications for the test will be accepted starting in late September. The advanced road traffic system uses information obtained from nearby vehicles and roadside optical beacons to alert drivers to potential danger from approaching vehicles. The information is received by an onboard antenna on the vehicle. In addition, the system uses the information to warn drivers when they are speeding in school zones. It also provides drivers with fastest-route information using probe data – information on the position and speed of vehicles obtained by wireless communications technology. This system alerts drivers to the presence of vehicles moving too fast at blind intersections. 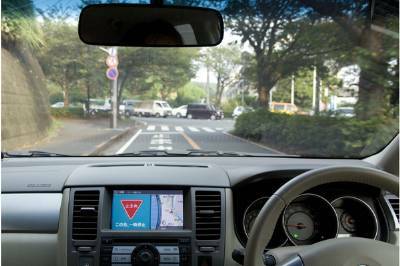 For example, if the system determines that a car is approaching a driver too fast from the left, a buzzer will sound and a voice recording will call out: “Car approaching from left.” At the same time, an image of an approaching vehicle will appear on the driver’s CARWINGS navigation screen. The system will also alert a driver when is detects that he or she is approaching a stop sign or red traffic light too fast. This system warns drivers when they are speeding in a school zone. As soon as a driver passes the speed limit sign in the area, a buzzer will sound and a voice recording will warn: “School ahead. Watch your speed.” An image of a school zone sign will also appear on the driver’s navigation screen. This system informs drivers of the quickest route to their destination using probe data collected from mobile phones of CARWINGS subscribers, including taxi owners, as well as vehicle data collected by mobile phone operator NTT DoCoMo, Inc. All of the data is sent to Nissan’s probe server where it is collectively processed into traffic information. The data is then sent to the driver’s navigation screen where it is displayed in the form of real-time maps showing the traffic flow of a greater coverage of roads compared to VICS (Vehicle Information and Communications System), a public service providing similar information via FM multiplex broadcasting, as well as radio wave and infrared beacons. Both the vehicle alert and the speed alert systems will be tested until the end of fiscal year 2007. The dynamic route finder system will be tested until the end of fiscal 2008. Nissan’s intelligent transportation system test is being implemented in cooperation with NTT DoCoMo, consumer electronics maker Matsushita Electric Industrial Co., Ltd., and Xanavi Informatics Corp., a maker of vehicle navigation systems and software. Matsushita Electric has developed the roadside optical beacons for the test in conjunction with Japan’s National Police Agency, the Kanagawa Prefectural Police Headquarters and the Universal Traffic Management Society of Japan (UTMS). Based on the results of the test, Nissan is planning to implement its intelligent transportation system in Japan and then globally in the future as part of its efforts to help reduce traffic accidents and congestion. In Japan, Nissan has set a target of halving the number of traffic fatalities or serious injuries involving Nissan vehicles by 2015 compared with the level in 1995.